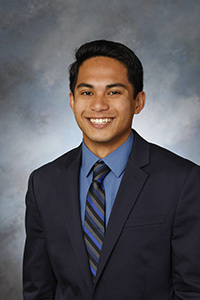 James Peña, Hall Director, Schoenfeldt Hall, joined the University of Portland in 2015 as the Assistant Hall Director of Schoenfeldt Hall. James grew up in Hawai'i and holds his Bachelor's Degree from George Fox University in Biology. During his undergraduate career, James served as a Resident Assistant for two years and then as an Assistant Area Coordinator the following year. While serving in his current role as Hall Director for the men of Padre, James also models his commitment to academics as a recent graduate of UP’s master of arts in higher education and student affairs program.